Let’s begin with a map. The Bundy family is grazing its cattle on federal lands for free. It refuses to pay. This is a property rights case on the surface. We need to get beneath the surface. The real problem can be seen on the maps. The federal government exercises ownership over land that it should not own. If the federal government auctioned off this land to the highest bidders, using the money exclusively for paying off the federal debt, the nation would be a lot better off. But the government refuses to do this. Not to mention that the entire southwest US was taken from Mexico in a war that violated an established treaty. I'll try to make this simple for even a liberal to understand. US Constitution: Article I, Section 9, Clause 3: No Bill of Attainder or ex post facto Law shall be passed. Since the Bundy family has been grazing cattle on that land PRIOR TO the formation of the blm, the family was automatically Grandfathered into the 'grazing RIGHTS' and cannot be subjected to any government intrusion. Since the Constitution requires the federal government treat ALL States in an equal and fair handed manner, the federal government cannot claim lands within any Sovereign State without the 'permission' of the People of that State, and any lands so taken shall be reimbursed to the State. The 'public lands' belong to the Sovereigns of the State, not the state itself. All the claims of 'federal lands' are spurious and have no legal foundation under the Constitution. Uh I think Mexico has invaded the US if Im not mistaken – and Im not. I've seen court documents that tell a far different side. Bundy has lost all the court battles he has been in and all appeals so he stops acknowledging the Federal government. According to the most recent court ruling he is responsible for all costs incurred removing the trespass cattle. Do you also dispute the Louisiana Purchase? No one has mentioned the Turtles thrive on cow patties for food. Bundy should charge the government for keeping the fields clean and trurtle feed. Harry, when the Chinese come for there land grab we the people will be ready! yeah imagine that a Federal Judge on the Federal payroll would always find for the government!! The Treaty of Guadalupe Hidalgo (Tratado de Guadalupe Hidalgo in Spanish), officially entitled the Treaty of Peace, Friendship, Limits and Settlement between the United States of America and the Mexican Republic, is the peace treaty signed in 1848 in Guadalupe Hidalgo between the U.S. and Mexico that ended the Mexican–American War (1846–48). With the defeat of its army and the fall of the capital, Mexico entered into negotiations to end the war. The treaty called for the United States to pay $15 million to Mexico and pay off the claims of American citizens against Mexico up to $3.25 million. It gave the United States the Rio Grande boundary for Texas, and gave the U.S. ownership of California, and a large area comprising New Mexico, Arizona, Nevada, Utah, and parts of Wyoming and Colorado. Mexicans in those annexed areas had the choice of relocating to Mexico or receiving American citizenship with full civil rights; over 90% remained. Many of the answers to the question posed in the title of this article reflect victims of dialectical materialism: the thesis and antithesis, concluding in an intended synthesis. Neither the federal government, state governments, nor the people own the land. Yahweh, as Creator does. Thanks to Amendment 5 of the federal Constitution and its establishment of eminent domain, leading to the appropriation (theft) of private land turned into public land, and the Constitutional Republic’s insidious property taxes, every square inch of land in America is owned by the government of the Constitutional Republic (something impossible under Biblical law, see Exodus 19:5, Psalm 24:1 & Leviticus 25:23) and therefore the Bundys and the protesters ultimately don’t have standing in this situation. Appealing to the Constitution or the Bill of Rights in this and similar situations is the epitome or irony! For more, see online Chapter 14 “Amendment 5: Constitutional vs. Biblical Judicial Protection” of “Bible Law vs. the United States Constitution: The Christian Perspective” at http://www.bibleversusconstitution.org/BlvcOnline…. While Thomas Jefferson did do the Louisiana Purchase, he was obviously uncomfortable with accusations that it was unconstitutional for the US government to complete that agreement, because technically he didn't have that power. But almost no one could pass up the great deal. Was the Treaty of Guadalupe Hildago signed by Mexico under duress? I am not sure which is why I am asking. Indeed, since that is exactly how Mexico lost the southwest USA in the first place(lots of Anglo immigration) I assume they figure they can try and pull the same trick. Yawn, government rules in favor of itself. And in other profoundly exciting news, scientists have discovered that water is wet. Perhaps, it is time for some restructuring, I pose the question, should our federal government own land? Maybe, our federal government should only lease this type of land from the state, should state law rule? You're exactly right, Zorro. He stopped paying his lease in 1993. He's been grazing his cattle for 2 decades, and told the government to basically "go F yourself." He's no patriot. He's a criminal, and the people rallying to his cause and threatening to kill federal agents are nothing more than domestic terrorists – an American Al-Qaida in the making. IT WAS A DIFFERENT TIME!! We HAD slaves too!! Get over it! NO, Shane, you and Zorro are wrong. The Bundy's ancestors purchased the grazing rights (as ranchers did back 100-200 years ago) of that 600,000 acres from the US government well before the blm was created. And just like mineral rights, once purchased, they are property and ownership is transferred by the owner. The US government never bought back those rights, but instead created the blm to steal more of this rancher's livelihood. The blm was created as a management tool to ensure that the land was not overgrazed and the land maintained for the public, wildlife, and the ranchers using it. But as with ALL government agencies, they evolved into a militarized extortionist agency wanting to squander our land and resources for thei benefit (not the country's. It's amazing how many idiots like you will side with the government because you have been brainwashed and DO NOT know or understand the facts. You morons think that the government is protecting public land when they are actually holding it for the right deal to line their thieving pockets, as with harryass Reid and the Chinese. All of this extremely misleading to people and wrong. First of all, the federal government CANNOT OWN constitutionally ANY sovereign state land. The federal government cannot OWN land through executive order. Executive orders are for the 10 square miles of DC. and pertaining to government matters, or when we at war and the president is the commander in chief. "New States may be admitted by the Congress into this Union; but no new State shall be formed or erected within the Jurisdiction of any other State; nor any State be formed by the Junction of two or more States, or Parts of States, without the Consent of the Legislatures of the States concerned as well as of the Congress. The Congress shall have Power to dispose of and make all needful Rules and Regulations respecting the Territory or other Property belonging to the United States; and nothing in this Constitution shall be so construed as to Prejudice any Claims of the United States, or of any particular State." NOTE: "Power to dispose of"—this right here should tell you a whole lot. The federal government can acquire territory, but they must dispose of it to whom? The people and the states. NEXT is this phrase: "and nothing in this Constitution shall be so construed as to Prejudice any Claims of the United States, or of any particular State." It is clear here that the federal government CANNOT make, through prejudice, any claims on any particular state". In other words, the federal government CANNOT make any claim they own sovereign state land. "To exercise exclusive Legislation in all Cases whatsoever, over such District (not exceeding ten Miles square) as may, by Cession of particular States, and the Acceptance of Congress, become the Seat of the Government of the United States, and to exercise like Authority over all Places purchased by the Consent of the Legislature of the State in which the Same shall be, for the Erection of Forts, Magazines, Arsenals, dock-Yards, and other needful Buildings;-"
In other words, the property of the federal government is: The 10 square miles of DC, all places purchased BY THE CONSENT of the state legislatures or THE PEOPLE., and NEEDFUL buildings, such as federal buildings, forts, military bases, etc. THERE is NOTHING in the Constitution that grants the federal government arbitrary control over ANY state land. There is nothing in the Constitution that gives the federal government the power to control or manage any sovereign state land. We are nation made up of 50 individual sovereign NATION STATES, each with their OWN governments and state legislatures. The people of the states CREATED the contract of the Constltution. The Constitution begins with "WE THE PEOPLE in order to FORM a more perfect government…." THE PEOPLE CREATED the federal government, therefore THE PEOPLE are in AUTHORITY OVER the federal government. "This Constitution, and the Laws of the United States which shall be made in Pursuance thereof; and all Treaties made, or which shall be made, under the Authority of the United States, shall be the supreme Law of the Land; and the Judges in every State shall be bound thereby, any Thing in the Constitution or Laws of any State to the Contrary notwithstanding. The Senators and Representatives before mentioned, and the Members of the several State Legislatures, and all executive and judicial Officers, both of the United States and of the several States, shall be bound by Oath or Affirmation, to support this Constitution; but no religious Test shall ever be required as a Qualification to any Office or public Trust under the United States." ALL LAW in the federal government and the states MUST be rooted in the base law of the Constitution. "The powers delegated by the proposed Constitution to the federal government, are few and defined. Those which are to remain in the State governments are numerous and indefinite. The former will be exercised principally on external objects, as war, peace, negotiation, and foreign commerce; with which last the power of taxation will, for the most part, be connected. The powers reserved to the several States will extend to all the objects which, in the ordinary course of affairs, concern the lives, liberties, and properties of the people, and the internal order, improvement, and prosperity of the State." I add that Indian reservations are NOT owned by the federal government. They are actually individual sovereign nations. The federal government has no jurisdiction there either. Also read the 9th and 10th Amendments. Its just that nowadays the government has its greedy hands in everything. So people get tired of the bullying and try to protest in some way. A legal citizen will NOT get a fair shake in todays federal courts, unless that citizen is being paid back for some candidates election. We used to have a representaive goverment for the people. That no longer exists. What goes on right now may not seem to effect you personally, henseforth you can be on the fence so to speak. But the results of something like the Bundy case, and I assure you its not over, can apply to something in the future that you hold dear to you, in some way. Our senate majority leader seems to be a greedy, self centered person, so Bundy better watch his back! Just saying. And when the Spanish landed in Mexico, they found Spanish-speaking, Roman Catholic Indians who just gave them their land. There was no imperialism, no subjugation, no displacement of people, certainly not by the egalitarian, live-and-let-live Spanish. The angelic Mexicans, therefore, have a God-given right to their lands. And to "crustyoldgeezer," the Constitution's banning of ex post facto ("retroactive") laws does not pertain to Bundy's situation. The formation of the BLM (1946) is not the determinative time-point of ownership; the time-point of ownership is the time the land was acquired (1848). Are you claiming that the government has no say in any lands it acquired prior to 1946? And if people dug deeper, they would find that all this "constitutional" clamor is just pretext to cover the real motivation: money. Bundy doesn't want to pay to maintain his private commercial enterprise, and the states want federal land so they can sell it and then tax the buyers. There may even be a book somewhere that says something about the love of money and the root of all evil. You claim that the timing of the formation of the BLM is crucial in determining grazing rights, but you conveniently ignore the fact that the land was federal (1848) before there was a state of Nevada (1864). It's not a case of the federal government claiming land within a "Sovereign State," but rather a state trying to claim land that was federal land 16 years before that state existed. "He's …told the government to basically 'go F yourself.'" "and the people rallying to his cause and threatening to kill federal agents"
Everyone, notice that Shane has produced no evidence of anyone threatening to kill federal agents. In fact it was federal agents who stupidly threatened to kill and sicced their attack dogs on unarmed peaceful protesters that turned public opinion against the BLM. Which is why the government ran off with its tail between its legs and went crying home to mommy. "are nothing more than domestic terrorists – an American Al-Qaida in the making." More utterly laughable nonsense from Shane, clucking like chicken little that the sky is falling. He cracks me up. Prior to the Taylor Grazing Act of 1934 any rancher could graze their herd on federal land for free. Taylor was passed specifically to force ongoing (not one-time) payments for 10 year grazing permits – no rancher was ever 'grandfathered' to be able to continue to graze federal land for free. I’ve heard several allegations that Bundy’s family purchased the grazing rights. In order for real property rights to be recognized by the courts, evidence of those rights must be recorded with the county Registrar. If Bundy has these rights, it should be easy enough to pull the documents evidencing those rights from the county Recorder’s Office. Considering all the people interested in this case, it seems reasonable to think that SOMEONE would pull the documents, scan them, and put them online for all to see. Or, in the alternative, draft and publicly post an affidavit stating that a search for such documents produced nothing. Anyone willing to produce documentary evidence? "And if people dug deeper, they would find that all this "constitutional" clamor is just pretext to cover the real motivation: money." This is true, it is about money. Harry Reid wants to take the land from Bundy so he can line his own pocket as well as his Chinese cronies through some half-assed green energy program that will cost taxpayers a bundle. It sure isn't about grazing rights, or turtles for that matter. If the federal government actually cared about turtles it wouldn't have set off so many nukes in Nevada in the first place. The constitution says, the fed govt. can only own 10 sq mi., of any state. They should put those armed thugs on the border to stop thousands of illegals, and leave that family of patriots alone. They may have promted an armed revolt. Where I live people are pissed ! If we 'bought' the Louisiana purchase from France, Who did France get it from to be able to sell it to US ??!! Did they buy it ? Think NOT ! Treaty of Hidalgo was 'not' a purchase order, it was a settlement of a WAR ! In that case, all but the original 13 Colonies are infringing on "Federal Land", tis means unless you live in one of the "Original" 13 States, the Government can kick you out of your house and not pay you a nickel, As for the original states some are Commonwealths, Penna. Mass. and Virginia are Commonwealths, as is Kentucky, but not an original, just was part of Virginia. You forgot all "Liberal Judges"
Don't forget papers go missing al the time in Liberal controlled court houses. Auction should be to residents of the State or Commonwealth in which the land lies, a rule should be in acted before sale, that no foreign country or principality can purchase land within our Constitutional borders. Any Corporations buying property for the use of exploring for Gas, oil or such should show proof that it is not owned or financed by another country or principality, a clause should read that if this is found at ANY later date that this is not true that all properties ill be forfeited back to State or Commonwealth. We need to make sure NO Foreign, such as our enemies, countries come in and buy up land. LOL you are very misinformed. Force the epa and blm to enforce laws in the Southern border States all along the border and harass the illegals and the drug trades with as much fervor and bullying as they use against Law Abiding Citizens that are here LEGALLY. IF they had been doing that for the last 40 years, there would be no 'undocumented' murderes, rapists and leeches on OUR Infrastructure. GOOGLE: 'Tom DeWeese Agenda 21"
Also can find the source on the UN's (United Nation) Website. Great idea CrustyOldGeezer! But they (Gov't) would rather harass the GOOD hardworking Law Abiding Citizens and there is a GOOD Reason for that. It's in the UN AGENDA 21 PLAN which is a easy read if you GOOGLE: 'Tom DeWeese Agenda 21' or you can go to the UN Website for the 'source' itself. I think all so-called "Federal" lands should be surrendered to the ownership of the States in which they are located, except for those lands that have been officially set aside for Federal use, such as military bases. Sorry Christian Dominionists – you are not in charge yet. No matter what you think should happen, the rule of law still holds in the United States. Yes, and descendants of all of those tens of thousands of people who obtained 160-acre homesteads from the 2 million acres of federal land opened up in the Oklahoma land rush of 1889 must give up any and all titles to those lands because, since the Bureau of Land Management was not yet in existence, the federal government had no right to give those lands to homesteaders. Not that they had much choice— but it's ours now. 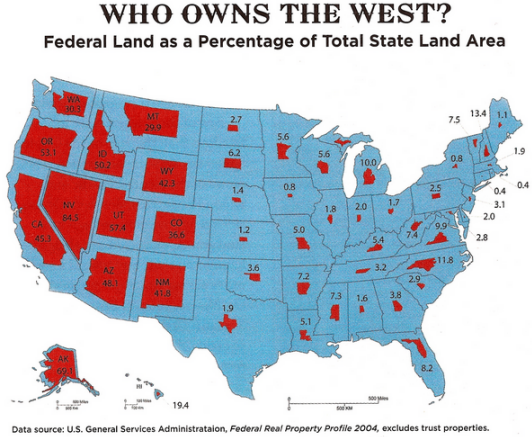 Those states want their land back….it should be given back to them too. Thank you for that comment…. I'm so tired of the idiotic arguments I'm hearing on TV that I'm sending this one and another one below to FOX news and my representatives. Going by a court ruling is a ludicrous argument as court rulings that aren't constitutional are illegal rulings, and many have been struck down….why don't you have your "legal experts" at FOX do their homework instead of misinforming the public as you have been doing? The silence of my representatives is deafening. Put up— or shut up and resign. This situation grossly impacts all Americans, not just Nevadans. You all took an oath to uphold the constitution. DO IT. Shameful that only Rand Paul has said this land should be restored to the states. If you used state's "federal" land as collateral for the loans from the Chinese you should be charged for treason because that's sure what it looks like to the average citizen. Reid can't sell them this land for pennies on the dollar and I want to see not just a full investigation of that shady deal… but also a full investigation of who authorized the excessive force at the Bundy ranch….get a special prosecutor because congressional hearings don't ever result in prosecutions anymore. Toothless tigers grandstanding for votes. However, water rights are issued by the state – but they have no influence on whether or nor the BLM issues a grazing permit. In 1993 as part of a new contract the BLM mandated a herd reduction (IIRC, down to only 150 head) that would cost him most of those water rights. Unfortunately, because he didn't sign he missed out on a multi-million dollar buyout a few years later. (other ranchers still had grazing permits on that land). and now they are going after all the ranchers in Texas along the Red River that should be interesting based upon the Nevada gambit Texans will not go peacefully.